Join Microchip / Atmel® Tech on Tour! Microchip / Atmel® Tech on Tour brings the experts to you. By attending a training session held in your city, you will get hands-on experience in designing with the latest technologies. The newest wave of electronics products—from wearables to smart, connected devices to automotive applications—require a whole range of foundational technologies. As the number-one supplier of microcontrollers (MCUs), Microchip / Atmel offers everything you need to design your next big thing, from embedded processors with the world’s lowest power consumption to cloud-ready Wi-Fi and Bluetooth connectivity. Tech on Tour will show you how to leverage these products and Microchip / Atmel expertise to easily bring differentiated designs to market. Tech on Tour will also introduce you to the industry’s most highly integrated Internet of Things (IoT) solution. It includes Atmel AVR® and Atmel | SMART ARM® Cortex®-based MCUs, as well as software, connectivity, and security for connected devices. Plus, you will discover the rich ecosystem of design tools and development partners that supports it all. 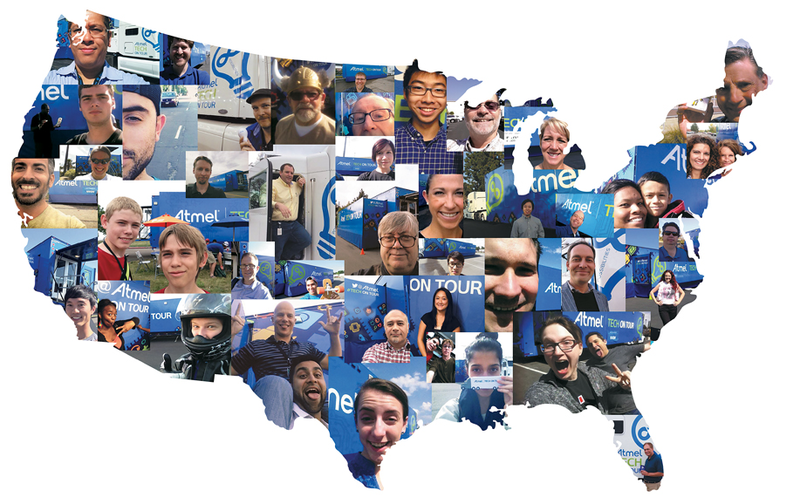 Follow the excitement of @atmel and #techontour on Twitter and Facebook. You don’t see a stop near you? Be sure to request one here.